Protein shakes are designed to provide large quantities of protein and other nutrients in an easy-to-consume beverage. The high protein content of these shakes makes them ideal for bodybuilders or people who are looking to gain muscle mass. Because protein is very filling, protein shakes can also be used as meal replacement beverages for people looking to lose weight. Although you can buy pre-made protein shakes, these products often leave something to be desired in the taste department and can also be expensive. By making protein shakes at home you can develop your own delicious concoctions -- and save money doing so. Find a protein powder that you like. There are many different kinds of protein powders that are commercially available, and each of them have their own unique taste and flavor. The Nutrition Express website notes that animal protein powder is superior in nutrition and taste to plant protein powders, but you will have to decide for yourself which powder has the best taste. It is important to find a brand of protein powder that you like, since this is what will provide the nutritional backbone for your protein shake. Add fresh fruits, nuts, peanut butter and other flavors that you like. Pick ingredients that will add to the nutritional value. Fresh fruits add vitamins and carbohydrates in addition to making your shake more delicious, CriticalBench.com explains. Nuts and peanut butter add protein as well as flavor and work particularly well with chocolate-flavored protein powders. Add your liquids in stages. 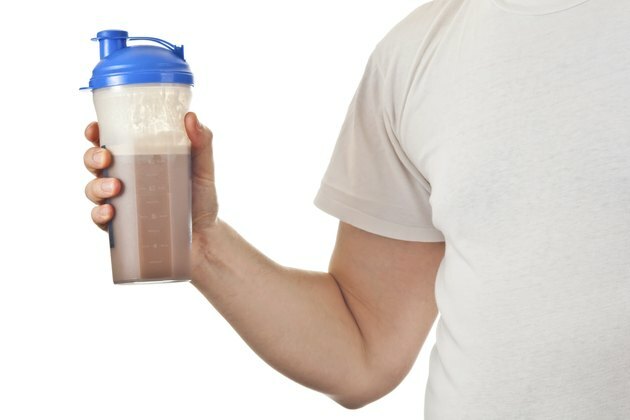 Whether you use fruit juice, milk, water or some other liquid, the amount of liquid that you add can have a drastic effect on your protein shake, CriticalBench.com notes. Too much liquid and your shake will become thin; too little and you may need to eat your "shake" with a spoon. One way to make sure that you find the right balance is to begin with some liquid and then blend all of your ingredients. Once your dry ingredients have been broken down, you can add small amounts of water, milk or juice and then blend for a few more seconds to gradually change the consistency of your shake. Experiment with different recipes. There is no wrong way to make a protein shake, so feel free to try new ideas and ingredients. Project Swole, for example, has 94 different protein shake recipes to try.